The drifts that form in the lawn chairs look like snow people, lounging in the back yard. I’d been having a bit of snow envy. Well, not anymore. Hello white stuff! It is the snow that really keeps winter fresh. 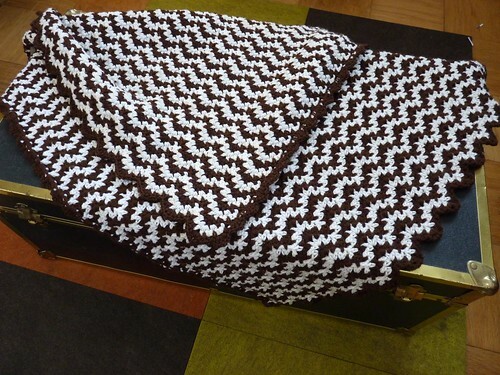 My first blanket of the 2011 Blanket Challenge is done! Yay! The pattern came from Churchmouse Yarns. I enjoyed crocheting this blanket but the ends were a bear. There has to be a better way of dealing with alternating row stripes. 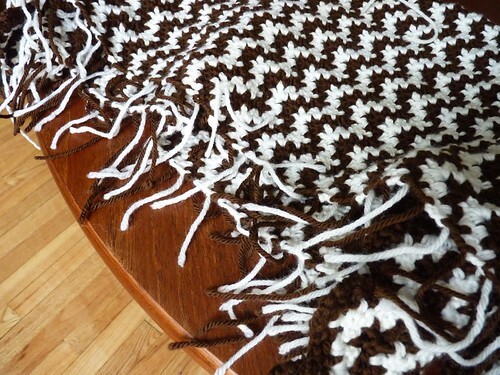 If I make this blanket again I will do three colors, so I can bring the color up, instead of having all the ends. The stairwell and upper hallway…Obviously we are struggling to find the right color. I had originally wanted red but with the wood colors of the floor and trim, the red does not sing, plus there was a lot of concern about “darkness”. How about something brighter, cheerier, like a yellow? The color of goldenrod or…mustard? Eh, it just doesn’t work at all. After living with the red and yellow blocks for months, we went back to the beginning and came up with a shadowy purple. It seems to make the wood work gleam and has a soothing, rich, modern feel. The color we have agreed on is the slightly darker of the two purples pictured above. It is called “Mystic Mount”. While I was painting the sample squares I was thinking about the name…mystic mount… Obviously the most well known mystic mount is the unicorn. But how is SB going to feel about unicorn colored walls? Also, isn’t it strange..when I think unicorn I don’t think purple. Unicorns, they are all sparkles and white and pink. When I mentioned this to SB he pointed out that mount could also refer to mountain. Oh!!! Like mountains seen in the distance. Like purple mountain majesty. Huh, I guess that makes more sense than unicorns. Lavender is the new beige. From lilac to amethyst, it’s an extraordinary neutral and a great unifier — a soothing, peaceful color that is timeless. Lavender reflects light well, which is why you see it all over Scandinavia. In the depth of winter, it’s a very cheerful color to walk into. We pulled this lavender from the evening sky and summer flowers like lilac and lupine. In the bright sun, it takes on a warmth that brings out the red in the purple, but then as the light fades, it cools down and becomes this beautiful blue. Instead of unicorns I’m going to try picturing the evening sky, summer flowers and misty mountains. For our first anniversary we spent a long weekend in Savannah and I had my first bourbon stout. I was an immediate convert. Bourbon, it makes beer better! Around Atlanta, bourbon beer couldn’t be found and faded to a pleasant memory. Back Wisconsin, I discovered Tyranena Brewery, and rekindled my love for bourbon barrel stout, which they produce year round. Today we toured the brewery and pictured here are the very barrels full of beer steeping in bourbon essence. 2011, the year of the baby, at least among my friends. I remember a couple years back when it was all weddings and falling in love. Yet, this sudden baby boom has caught me by surprise. Having children, who knew it would be so popular? I’m expecting seven babies by July, plus two more that came late in 2010. That’s a lot of yarn crafting! To celebrate all this fresh new life, I’ve set a challenge for myself, to complete nine (9, nueve) blankets by the end of July. Some will be knit, some crochet. I plan to make them all “adult” size, since babies don’t stay baby size for long and blankets can last a lifetime. Plus, aren’t they really for the parents, anyway? I’m closing in on completing the first blanket, previewed above. Since I have two babies coming in February and two in March, if I can get a little ahead now, then by early spring I only need to be making one per month.